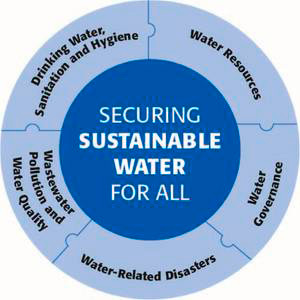 This month, UN-Water launches its new strategy 2014-2020 entitled ‘Delivering as One on Water Related Issues’. The concise document provides the main directions for the seven years ahead and outlines what success might look like in 2020. After ten years of working together, this strategy reaffirms the commitment of UN-Water. It sets the stage for the seven years ahead in terms of strategic directions, ways to collaborate and portrays a strong mechanism with a clear vision of where to go and how to get there. “The launch also provides an opportunity for more stakeholders to get on board and play an active role with water issues gaining more momentum – especially in the post-2015 discussions,” says Michel Jarraud, the Chair of UN-Water Strategy_2014-2020.